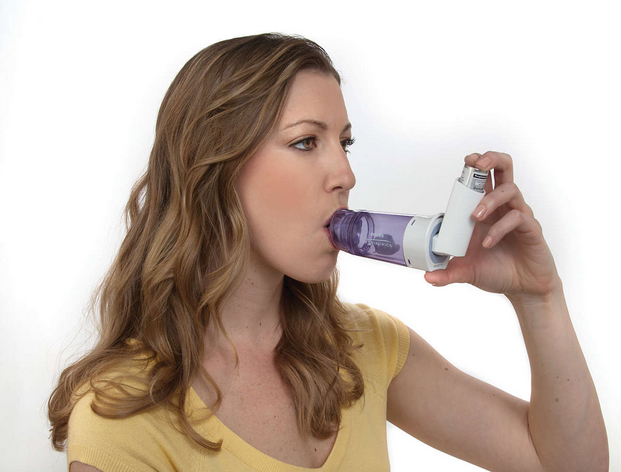 Asthma is a chronic (long-term) disease in which the lungs become inflamed and airways narrow and react to "triggers." When the lungs become irritated, the airways swell and mucus builds up, causing shortness of breath, coughing, wheezing, chest pain or tightness, tiredness or a combination of these symptoms. People with uncontrolled asthma often have difficulty sleeping and breathing, may miss school and work, and often face costly medical bills due to hospitalizations and emergency department visits. Asthma affects people of all ages, and most often starts during childhood. In Vermont about 67,000 people have asthma, and nearly 9,600 are children. Fortunately, if a person with asthma gets an accurate diagnosis, learns to avoid asthma triggers, and takes medications as prescribed by a doctor, asthma can be controlled. People with asthma can live active, healthy lives. To see how we are doing in Vermont, go to the Respiratory Disease Performance Scorecard. Find Vermont data and reports on the Asthma Surveillance in Vermont page. See also Tracking Asthma in Vermont on Health and the Environment. It is not clearly known why or how people develop asthma. Research suggests that a combination of family genes and environmental exposures produce asthma. Asthma can begin in early childhood or may first appear later in life. Not all childhood asthma continues into adulthood. Family history of asthma, respiratory infections in young children, exposure to tobacco smoke during pregnancy and/or the first years of life, occupational exposures, or exposure to other common “asthma triggers,” may lead to asthma. There are many kinds of triggers, and triggers may be different for different people. In Vermont, common asthma triggers that may make asthma worse include pet dander, smoke and fumes from stoves and fireplaces, tobacco smoke, air pollution, pollen, mold, mildew, dust and/or cockroach droppings. Decrease disparity in asthma burden across the state. The Health Department’s Asthma Program works in partnership with lung health experts, insurers, health care providers, hospitals and schools to implement home, school and community‐based service strategies, health systems strategies, and asthma‐related policy strategies to ensure guideline diagnosis and treatment of asthma patients, pursue affordable and accessible asthma care systems, promote asthma friendly practices that reduce environmental triggers and improve air quality, expand asthma self-management education, and strengthen linkages and referrals to care for those with highest asthma burden. You can quit. We can help. Living in a smoke-free environment is an important part of managing asthma, and for your overall health and the health of your children. There is no safe exposure to tobacco smoke, especially for children. When you decide to quit or are interested in learning more, these free services can help you find success. Best of all, through 802Quits you can access a coach and get free nicotine replacement – gum, patches or lozenges – shipped right to your door (while supplies last). Visit 802quits.org for more information. Allergy and Asthma Network – Mothers of Asthmatics, Inc. Wide-ranging information on a variety of topics of concern to people who have asthma, or parents of children with asthma. Provides comprehensive information about lung disease and respiratory conditions including research findings, management tips and advocacy connections. Latest news and current research from MEDLINE Plus. Includes data on asthma, effective interventions, definition of policy issues, and resources for consumers and health professionals. Learn about the environmental contributions to asthma and what can be done to reduce exposure to asthma triggers at home, school and work, and to outdoor air pollutants. Information about asthma for parents, kids and teens. Offers publications about asthma for children and adults. Schools can reduce asthma triggers by limiting chemicals and fragrances, such as found in disinfecting wipes used inside the school or on school grounds, that can trigger asthma and allergies, hurt student and teacher performance, and result in missed school days. Learn more about what schools can do. Asthma treatment for a child or an adult will depend on the severity of their disease. The goal of treatment is to control the disease and prevent asthma attacks. An individualized asthma action plan is critical. 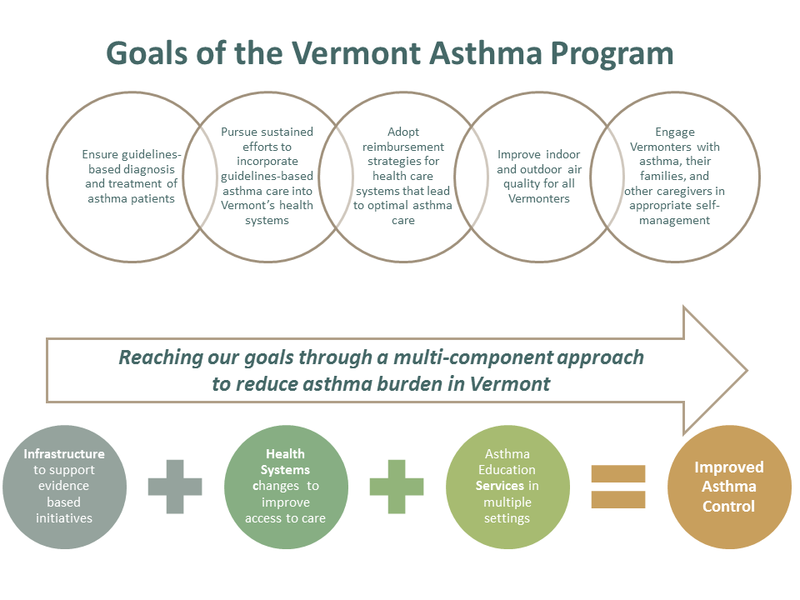 We work with a number of state health partners to improve asthma self-management among Vermonters. Good self-management means higher quality of life, better sleep, and fewer missed school and/or work days. Chronic Obstructive Pulmonary Disease, or COPD, is a large group of lung diseases characterized by airflow obstruction. COPD is often associated with symptoms related to difficulty breathing, but can be present without symptoms.